You’re in for a real treat when you book a fishing trip with veteran guide Jeff Sundin. 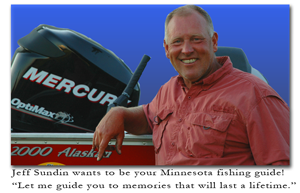 With a long standing reputation for providing customers with fabulous Minnesota fishing experiences. Sundin's 35 years of experience as a full-time, professional guide has earned him the reputation of a legendary angler. Covering a huge swath of territory in north central Minnesota, his service area includes hundreds of lakes of every shape and size. 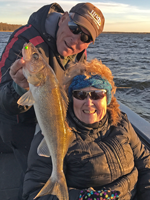 Along with moderately sized lakes like Bowstring, Big Sandy, Bemidji and Pokegama, Sundin also provides service on famous walleye fishing destinations like Leech Lake, Winnibigoshish, Cass and Upper Red Lake. Walleye are the most popular target species for his guests, but Jeff's expertise as a multi-species angler allows him to provide charters for every species that swims in northern Minnesota waters. He's well versed on a variety of techniques and he can take you fishing for Crappie, Smallmouth Bass, Northern Pike and Panfish on dozens of small waters as well. "Finding open water in the Grand Rapids area got a lot easier on Friday! In fact it amazed me how much ice disappeared in a single day. It left me wondering how much more will melt over the next couple of days. We will be watching and I promise to share whatever we learn. But like many of you, we first plan to enjoy some time celebrating Easter with our family. "I want to be your Minnesota Fishing Guide! Let me take you on a guided fishing trip for memories that will last a lifetime." Northern Minnesota is the perfect destination for your next fishing vacation. It's a multi-tasker's dream come true! We can fish for Walleye, go after Crappies, or maybe catch Perch, Northern Pike, Bass and Panfish. They are all available within easy reach of the Grand Rapids area! Nobody has more experience, no one works harder and nobody has more fun fishing than Jeff Sundin. "Book your next guided fishing trip with me and see what great customer service is all about. OH, by the way, we have gift certificates too." >> Book Your Guided Fishing Trip Now!